On election night in November, exit polls provided the first insight into how different demographic groups voted. But months later, other richer data sets are being released, and they provide researchers with new information about the election and the voters that participated in it. One such tool is the Cooperative Congressional Election Study, which is a large-sample national survey. The preliminary 2016 post-election version of the CCES study came out in early March, and it provides a treasure trove of information. One way of looking at the data is to compare the findings of the CCES to the national exit poll to see how they differ and what they say about the makeup of the 2016 electorate. This is not to say one is more right than the other; if anything, the truth may lie somewhere in between. There are also differences between the two data sets that make comparing them an imperfect exercise. Besides methodological differences in how the surveys were conducted, variations in how questions were asked and possible answers also complicate things. For instance, the 2016 CCES included more racial categories for respondents to choose from, such as “Middle Eastern,” that the exit poll did not use. It’s also important to note that many studies suffer from over-reported turnout, and the CCES is no different. Most surveys have a difficult time combating overrepresentation of actual voters, as well as the misreporting of voting by people who didn’t actually vote. The CCES will mitigate this to some degree in later releases of the 2016 data by attempting to validate the votes of respondents. And the CCES, like all studies, weights the data for various criteria, such as age, education, gender, and turnout. Still, the data do not perfectly capture the actual electorate that showed up on Nov. 8, 2016. Nonetheless, the CCES is one of the best resources we have for analyzing elections. With these important caveats out of the way, let’s dig in. The CCES provides further evidence of a healthy gender gap in American politics. President Donald Trump carried men by five percentage points and Hillary Clinton carried women by nine percentage points. But that 14-point marginal gap is smaller than the record-setting chasm in the exit poll (24 points), as shown in Table 1. Note: Columns and rows may not add up to 100 due to rounding. Race is one of the most important explanatory factors in voting behavior, with white voters tending to vote more Republican and nonwhite voters tending to vote even more Democratic. Thus, the ratio of whites to nonwhites in the electorate is very important. The CCES data showed an electorate that was slightly whiter than what the exit poll found. That finding corresponds to other work that finds the exit polls tend to exaggerate the nonwhite share of the electorate. The data in Tables 2 and 3 compare vote by race in the exit poll and the CCES. In Table 2, CCES respondents who didn’t identify as Hispanic or Latino on the initial race question but said they were of Spanish, Latino, or Hispanic background are included with the Latino cohort. The exit poll does something similar, which is controversial in the sense that those who identify directly as Hispanic or Latino are more Democratic leaning than those who only could be identified as such via the origin or descent question. In 2016, 8% of exit poll respondents chose Hispanic as their race while 3% identified as being of Hispanic or Latino origin. Similarly, 6% of CCES respondents identified as Hispanic or Latino, but an additional 2% said they were of Hispanic or Latino origin. As the exit poll included both groups together, we did the same with the CCES data to get a more apples-to-apples comparison. Notes: Latino demographic includes those who identified as being of Hispanic origin but not as Hispanic on initial race question. Columns and rows may not add up to 100 due to rounding. Even with the more inclusive definition of Hispanic/Latino, a notable difference between the exit poll and CCES data is the smaller share of Latino identifiers. But this distinction could be due to sampling issues (i.e. language barriers), so it’s probably best not to over-interpret it. In terms of electoral preferences, the CCES data offer further evidence that Latino voters may not have backed Clinton as strongly as many expected (though that is a debate that may last until the next election — or never end). However, it should be noted that the 2012 CCES found Barack Obama won Latinos 63%-36%, so Clinton’s margin in the 2016 CCES data represented a slight improvement for the Democrats. Just as the CCES data didn’t show as sharp a gender gap, it also doesn’t show as wide a race gap. Trump’s margin among white voters was 14 points according to the CCES versus the 20-point margin the exit poll found for him. 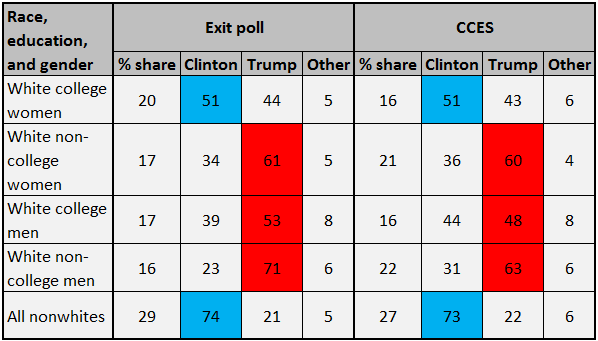 As Table 3 shows, the CCES found that Clinton won nonwhites 73%-22%, almost identical to the exit poll (74%-21%). When looking at race and gender, as Table 4 shows, the CCES corroborates the exit poll finding that a gender gap exists across race and ethnicity. Regardless of racial and ethnic background, men were more likely to vote Republican and women were more likely to vote Democratic. The gender gap among whites was not as pronounced in the CCES, but it was still there. As for the other groups, the CCES and exit poll largely agreed. Another key demographic trait is age. Race and education complicate voting by age, but it’s still clear that young voters were more likely than older voters to cast a ballot for Clinton. (Regarding CCES data on voting by race, age, and gender, Alexander Agadjanian put together a revealing breakdown for Decision Desk HQ.) But while the racial and gender gaps are more pronounced in the exit poll than in the CCES data, the age gap is sharper in the CCES data than in the exit poll. Tables 5 and 6 show age data with the familiar four-category age cohorts as well as a two-way split at age 45. In Table 6, the exit poll found that voters aged 18 to 44 backed Clinton by 14 points while those 45 and older supported Trump by eight (together, a 22-point gap). In the CCES data, Clinton won under-45s by 19 points and Trump won 45+ voters by 10 points (a 29-point gap). Regardless of the source, it’s very clear that younger voters — in part because they are far more racially diverse — tilted much more Democratic than their elders. The relationship between education and vote choice dominated much of the post-2016 election analysis, and with good reason. As Tables 7 and 8 indicate, voters with higher levels of education tended to vote more Democratic while those with lower levels of education tended to vote more Republican. The main story in these tables is the contrasting overall share of the electorate that had a college degree of some type (associate’s or bachelor’s degree). Whereas the exit poll found that 50% of voters claimed to be college graduates, the CCES data found 41% of voters had some type of college degree. This substantial difference may principally be a result of weighting (education was part of the CCES weighting process), but may also be a matter of how people defined themselves and the nature of the survey questionnaires. But overall, the CCES figures more credibly matched the adult population. According to the 2015 American Community Survey estimates, 42% of the adult population has a high school degree or less, 31% has some college experience or an associate’s degree, and 27% has a bachelor’s degree or higher. The corresponding categories for the electorate according to the CCES (not in the tables below) were 36% high school or less, 34% some college or associate’s degree, and 30% bachelor’s degree or more. Considering the fact that education is strongly correlated to turnout, it makes sense to expect the actual electorate to be more educated than the adult population. With that being said, the exit poll probably exaggerated the relative education of the 2016 electorate, and it has received criticism for doing so. Notes: For CCES data, “Some college” includes those who had some college education but did not complete a degree. “College grad” includes all those who had an associate’s or bachelor’s degree. Columns and rows may not add up to 100 due to rounding. Lastly, vote by race and educational attainment, as well as different racial, gender, and educational combinations, are worth exploring. These groupings reveal a sizable difference in voting among whites based on education and a small difference among nonwhites. The CCES found that Clinton narrowly carried white college-educated voters (48%-45%), the reverse of what the exit poll found. In the end, it seems fair to say that white college voters split about evenly between the major-party nominees. This is notable because it represents an improvement for the Democrats compared to 2012. Conversely, non-college white voters overwhelmingly chose Trump. While the two sources disagree somewhat, the difference between college whites and non-college whites is about the same: the exit poll found Trump did 34 points better among non-college whites versus college whites (+37 vs. +3), and the CCES found he did 30 points better (+27 vs. -3). Age also played a role in this, with younger whites voting more Democratic and older whites voting more Republican, but with increased education generally shifting the partisan tilt toward the Democrats across all age groups. Both the exit poll and the CCES showed that nonwhite voters with a college degree were slightly more likely to vote Republican than those without a college degree. Regarding gender, race, and education, the exit poll and the CCES found almost identical marks for white college women and all nonwhites, which formed a large part of the Democratic base. The numbers for white non-college women were also fairly similar. But the two sources were at odds over how white men voted; the CCES showed them to be less Republican-leaning than the exit poll. But while the CCES data showed white men and white women without a college degree to be less GOP-leaning than the exit poll, the CCES found them making up a larger share of the electorate, increasing their impact. Considering the razor-thin margins in key Rust Belt states such as Michigan, Pennsylvania, and Wisconsin (all states with sizable non-college white populations), it’s easy to see why this mattered. Notes: Nonwhite demographic includes those who identified as being of Hispanic origin but not as Hispanic on initial race question. Columns and rows may not add up to 100 due to rounding. As we’ve just reviewed, there are some notable differences between the exit poll and the preliminary CCES data, yet they broadly agree on the major demographic developments that affected the 2016 presidential election. The gender gap continues to be a fact of life in American politics, and the gap showed up across most every racial and ethnic group. Once again, whites voted substantially Republican and nonwhites voted heavily Democratic, but less so than when Obama led the Democratic ticket. The young and old were broadly in political disagreement, with younger voters leaning toward Clinton and older voters leaning toward Trump. Non-college white voters were considerably more Republican and proved decisive for Trump in the Rust Belt. More highly-educated white voters moved toward the Democrats, but not enough to make the difference for Clinton. Much more analysis of the 2016 contest between Clinton and Trump will come out in 2017 as additional data become available. For example, the 2016 American National Election Study is expected around the end of March. While the Crystal Ball is beginning to look ahead to the 2018 midterm elections, we agree that there is still much to be said about 2016. 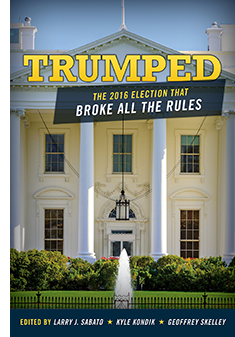 Our own in-depth study — Trumped: The 2016 Election That Broke All the Rules — is available for pre-order, and the book is expected to be fully released by mid-April.